The spring meeting of the new research group RELICS is devoted to the concept of cosmopolitanism: how has the concept been interpreted before and how can we shift its course in order to make it more valuable for the study of historical literatures and European identity? In this workshop, we consider ‘cosmopolitanism’ as a ‘travelling concept’. This term alerts us to the dynamic and changeable nature of concepts as they travel back and forth between diverse academic contexts, and their ability to change the very objects they analyse (Bal 2002, Neumann en Nünning 2012). 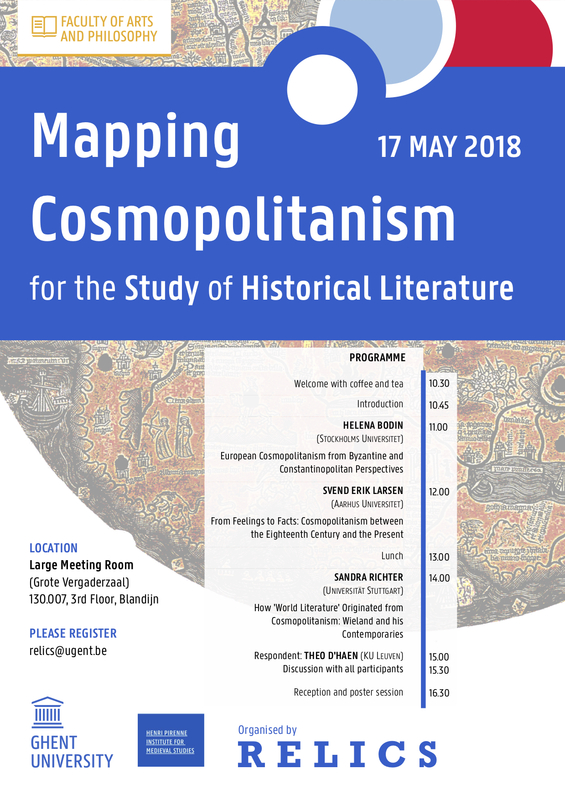 We want to map out the travels of ‘cosmopolitanism’ in academic discourse to see how it might transform our view of the history of European literatures. The second step would be to explore the future journey of cosmopolitanism through the domain of literary history. How can we develop the concept to make it dynamic and workable for historical literatures in all its facets: writers (their use of language, their identity, their project, their way of life,…), texts (their language, their style, their generic features,…), readers (their communities, their geography, their habits,…) etc. At the same time, how do we take into account the influence of our own academic background and practices (our discourse, our institutions, our worldviews,…)? In line with RELICS’s central aim of crossing borders traditionally set out by academia, the workshop thus wants to work towards conceptualising cosmopolitanism anew for the study of European historical literatures.